Can a brand exist without a name? Yesterday I had dinner at a very nice restaurant in Brussels. The service was excellent, and food was enjoyable. A funky item on the menu was a mix-it-yourself salad. The waiter brought me a piece of paper with a list of ingredients, and all I had to do was tick off the ones I wanted in my gastronomic concoction. I liked playing the "ticking the box game" and was quite satisfied with the resulting salad. A nice idea, which, combined with great service, led to a high level of customer satisfaction I for sure experienced. This is all good, but what was the name of the restaurant? Well, I have no idea! The next time I go there, I'll invite my friends to a ¨place where you can mix your own salads", but I won't be able to give them its name. The thing is, I did look for the name of the place above the entrance , but simply couldn't see any. I am sure it must have been there, just well hidden. The waiters' uniform didn't have any signs of the name either. One of the waiters was wearing a T-shirt with a logo of Havana Club, a bar in a totally different part of Brussels which probably had nothing to do with the "place where you can mix your own salads" . Another waiter had an altogether different logo on his T-shirt. Total confusion! This particular no name restaurant certainly has a lot of nice things about it, which for me personally resulted in the most precious thing all businesses should strive for: customer satisfaction. With some help of a visual identity consultant, this particular restaurant can introduce some logic and consistency to its look and feel, including a logo, interior design, the way the menu looks and the style of the waiters' uniforms. Higher brand awareness is guaranteed! 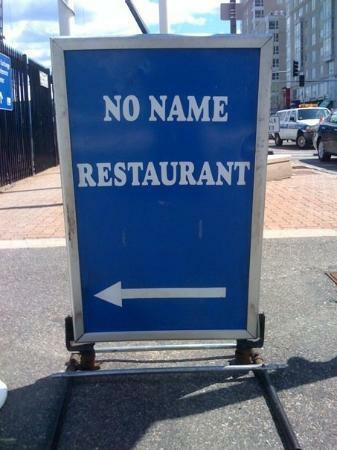 But for the moment, could I say that for me, this restaurant has a BRAND, if I can't even remember its name? I'd argue that it actually does. Although there are very many definitions of "brand" out there, the simple definition is that of a "personality" of a company, human being, country, exposition, etc. A set of unique character features, if you will. The no name restaurant that served me dinner last night, has a "personality" of a friendly place that allows you some creativity and participation in making your meal. A good brand name, if easily detected and memorable, can only enhance this personality. Good branding has nothing to do with trying to make a lousy business look nice. Chances are high that people will remember your name, but it will be tied to a bunch of negative connotations. Good branding is about first helping companies manage their business well, enabling them to provide good service and have authentic values and THEN translating this work into what's actually visible to the final customer. Trying to dress up a bad business into a nice package simply won't work. So, the "place where you can mix your own salads", just sort out that name stuff, and the rest will follow.